1.1 What are All on 4 Dental Implants? 1.1.1 Difference between All on 4 Dental Implants and Traditional Ones? 1.1.1.1 How do I Select a Credible Dental Implant Surgeon? At All on 4 Dental Implants Center in San Diego, we believe that everyone should be entitled to the healthy, natural-looking smile they’ve always wanted! If you suffer from missing, broken or damaged teeth, All on 4 dental implants might be the ideal solution for you. For anyone with teeth that are damaged or in need of replacement, All on 4 dental implants are a comfortable, permanent and more stable alternative to traditional dentures. Thanks to this revolutionary technique, All on 4 dental implants require little to no downtime or discomfort, and the treatment is available for patients of all ages. Not only are All on 4 dental implants a more permanent and cleaner substitute for dentures, the ground-breaking treatment is also more advanced and efficient than traditional dental implants. All on 4 dental implants have the ability to transform people’s lives by restoring not only their missing or damaged teeth, but also their health, confidence and well-being! Difference between All on 4 Dental Implants and Traditional Ones? Unlike traditional dental implants, All on 4 dental implants are installed with just four titanium posts, which serve as replacements for your tooth root, are embedded into each arch in your jawbone, rather than five to eight posts like traditional ones. Also, because All on 4 dental implants are installed at an angle, the fusion of these titanium anchors to your jawbone shorten treatment time when compared to traditional dental implants. How do I Select a Credible Dental Implant Surgeon? When choosing a dental implant surgeon, it is absolutely critical that your dentist has the extensive periodontal training and certification required to handle dental implants of any kind. Periodontists are highly trained and skilled at performing cosmetic dental restorations, such as dental implant surgery. When choosing your All on 4 dental implant specialist, it is also important to consider his or her experience with this particular technique, especially in complex cases. With his extensive surgical and periodontal training and expertise, vast experience with All on 4 dental implant surgery, and his commitment to quality client care, Dr. Jay Akef is one of the most highly regarded All on 4 dental implant specialists in San Diego. 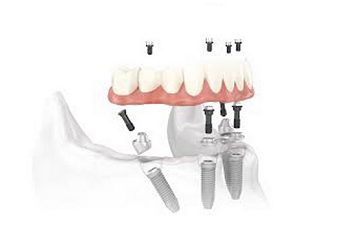 No matter how simple or complex the case, All on 4 Dental Implants Center in San Diego is equipped to handle it all. Using cutting edge technology and the latest dental surgery techniques, Dr. Akef and his highly talented team of dental specialists work with precision and skill to deliver the safest and most advanced dental implant treatment available. In just one visit, you can be in, out, and well on your way toward getting the beautiful smile you deserve. Contact All on 4 Dental Implants Center to schedule your next appointment today!